Hundreds of CUPE members joined with community allies to rally in support of the Leap Manifesto vision —which calls on Canada to act decisively to transition from a fossil fuel-based economy to a pollution-free economy. Keynote speakers Stephen Lewis and Naomi Klein sent a unified message that it is time for action on climate change. Lewis urged CUPE to continue the work on climate justice, while Klein said we don’t have any time to waste. “We can’t just leave this to the politicians, and if they’re not going to lead, then we’re going to lead,” she said. 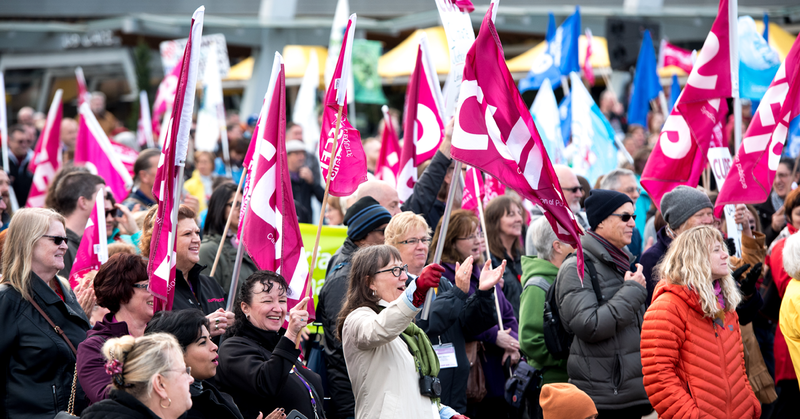 Several speakers noted that CUPE was the first union to sign the Leap Manifesto, highlighting the fact that the environmental and trade union movements are natural allies in the fight for social justice. CUPE national secretary-treasurer Charles Fleury added that CUPE will bring the Leap message to COP21 in Paris. Tsleil-Waututh leader Rueben George spoke of his Nation’s struggles to protect their traditional territories. With a powerful message about the future, young local activist and singer Ta’kaiya Blaney wowed the crowd with beautiful music and words. CUPE National President-elect Mark Hancock encouraged members to keep up the momentum and participate in the November 29 Global Climate March.